Global Warming! Is There Anything It Can’t Do? Frozen septic systems are emerging as an unexpected consequence of climate change in Minnesota — one that is bedeviling homeowners across the state and could soon cost taxpayers more for the repair and maintenance of fragile rural roads. 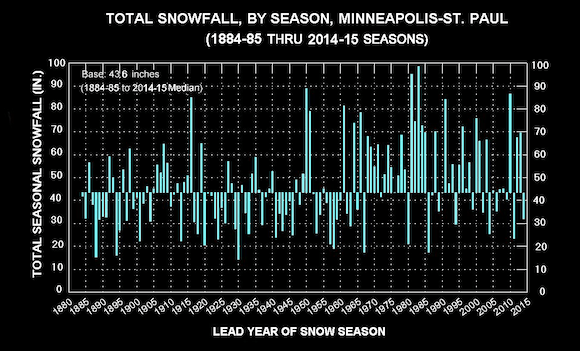 The cause is a dramatic long-term decline in insulating snow early in November and December. Combined with still-freezing conditions, that drives the frost line deep underground — well below septic pipes and drain fields. As a result, thousands of the half-million Minnesotans whose homes, cabins or businesses rely on underground septic tanks are facing a costly solution: pump their tanks more often and use their showers, washing machines, dishwashers and toilets less. 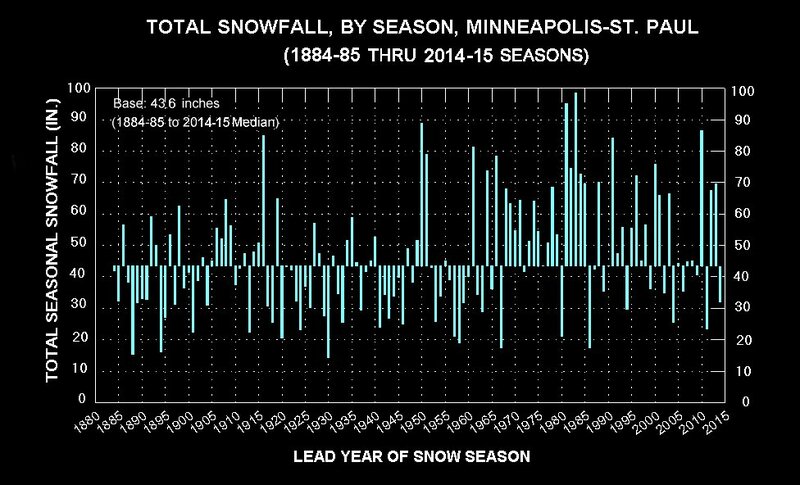 [A]ccording to Kenny Blumenfeld, Minnesota’s state climatologist, rising average winter temperatures have led to a dramatic change in snow cover. The average annual snow depth in Minnesota between Nov. 1 and March 31 has dropped by 20 to 30 percent, comparing the past 18 years against the period 1970 to 1999. And the total number of days without snow cover has increased even more — 30 to 50 percent, and even higher in some places. 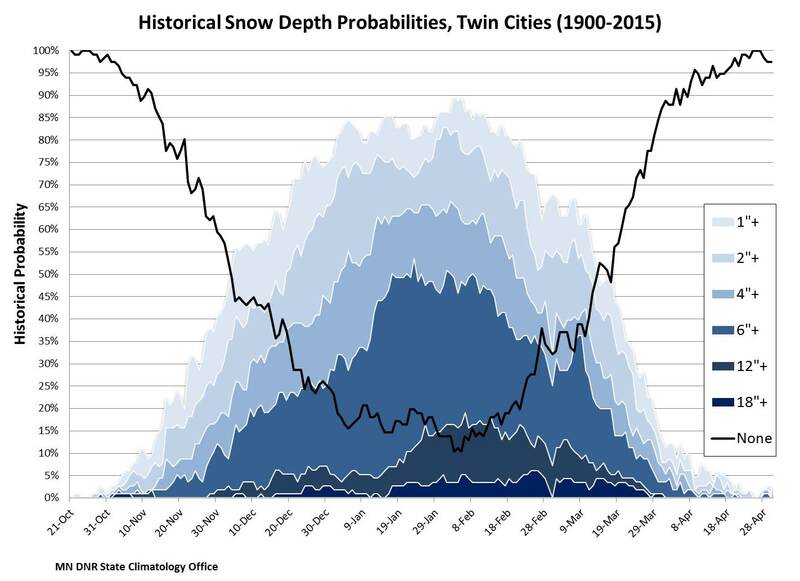 Historically, snowfall is highly variable. The climatologist chooses to compare the period 2000-2017 with the prior 18 years, 1970 to 1999. But this chart shows the broader sweep of Minnesota’s climate history from 1884 through 2015. The period being used as a baseline for the Strib’s comparison is the snowiest in the state’s recorded history. Snowfall has indeed returned to more normal levels after 1999, but it is still much higher than, for example, the period 1920 through 1949. Last April 1, Twin Cities residents played golf as thermometers flirted with the 60-degree mark. But early April won’t be balmy this year. A storm is expected to dump a double dose of wet, heavy snow on the metro area, with 2 to 3 inches expected Monday and another 4 inches coming Tuesday, meteorologists said Sunday night.